Ohrid lake, that came into being between four to ten million years ago, is Europe's oldest lake, and is amongst the oldest in the world. It is a typical oligotrophic lake, meaning that it contains low levels of nutrients. By its origin the lake is a tectonic one and belongs to the so-called group of "Desaretian lakes" (named by an ancient region called Desaretia). 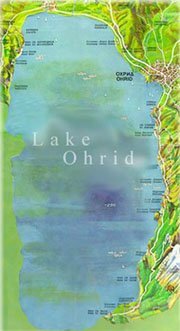 The Ohrid lake came about in the tertiary period, prior to the glaciations. Otherwise, most of the lakes of the world came into being immediately after the end of the latest glaciations period. Only a few lakes in the world are older than this one. Famous examples are Lake Baikal, Caspian Lake, and Lake Tanganyka and just a few lakes situated on Celebes, Philippines and China. Research on the living world of the Lake Ohrid has shown the existence of an exquisit flora and fauna, prolific in endemic, as well as relic fauna forms. Thus, the Ohrid lake is thought to be unique in Europe. Similarities can be found only with Lake Baikal and with the Caspian Lake. Lake Ohrid lies in the valley between Ohrid and Struga, in the border region between Macedonia and Albania. Ohrid lake is situated on 41 degree northern latitude and 20 - 21 degrees eastern longitude, and its altitude is 695 meters above sea level. Ohrid lake covers an area of 358.2 square kilometers, two thirds of which belong to the Republic of Macedonia, and the rest to the Republic of Albania. The shoreline is 87.5 kilometers long - the maximum length being 30.8 kilometers, and its maximum of 14.8 kilometers. The average depth is 164 meters, and the maximum depth 289 meters. The Ohrid lake is surrounded by mountain ranges of Mount Mokra (Mokra Planina - 1589 m.) and Jablanica (1945 m) on the Albanian side and by the limestone ridge of Mount Galicica (2255m) on the eastern side. The surrounding mountains are extremely carstic. Most of the Ohrid lake water bulk comes from numerous surface and underground springs. That is the reason certain researchers consider it unique in the world. Most of the surface springs lie along the southern shore, near the monastery of Saint Naum on the Macedonian side, and near the villages of Tusemiste (alb. 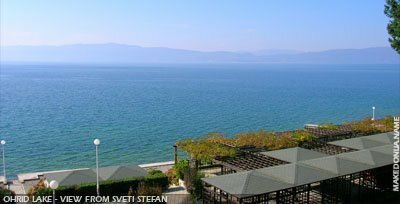 Tushemisht) and Starovo and the town of Pogradec in Albania. There are about 40 rivers and springs that flow into the Lake (23 on Albanian, and 17 on Macedonian territory). During summer, most of them dry out, whereas the rivers Sateska, Koselska, and Serava are the only waters with significant water flow that feed up the Ohrid lake. In the beginning of this century Jovan Cviik stated his assumption that the water of the adjacent Lake Prespa, with a water level 158 meters higher, will sink through the carst areas of the mountains Galicica and Suva Gora. 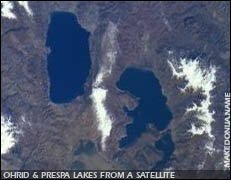 By using natural isotopes, in 1980 it was proved that the lakes of Prespa and Ohrid were connected hydrographically. Evidence have confirmed that more than 50% of the water from the springs near St. Naum come from the Lake of Prespa. The climate of the Ohrid lake is classified as a local-continental type. Medium annual temperatures average to 11.4 degrees Centigrade. Medium monthly temperatures average to about 21.2 degrees in July and August, and 34.4 being the absolute maximum in August. The lowest medium monthly temperature amounts to 1.5 degrees in January, whereas - 17.2 degrees is the absolute minimum. The average annual rainfall in the Lake basin amount to approximately 759 mm. The most common wind is the one blowing from north, particularly in autumn and winter. The winds blowing from southern and south-east directions dominate during spring and summer periods. Southeast and east winds are insignificant. Windy and calm periods change during the day, particularly in summer. Mornings are characterized by the shifts between blowing northern winds and calm periods. Weather conditions become quite different in the afternoons when the southern and south-east winds overtake the silence. Average speed of the wind in the Ohrid region is relatively low, 3.4 m/sec. Ohrid lake is a distinctive shelter of large number of freshwater organisms originating from the tertiary period, whose close relatives can be found in fossil forms only. For precisely this reason, the Ohrid lake bears the name "Museum of living fossils". Its remarkable age, continuing existence, geografic isolation, and the permanency of its living conditions - all of these together enabled most of its inhabitants to continue the process of their further evolution up to this day. This also made it possible for the already existing tertiary living forms in the Lake to further evolve into new taxonomic classes including, subspecies, species, even entire families of newly evolved organisms. Thus, the endemism (presence of distinctive, unique organisms), although less underlined than in Lake Baikal, is the feature of the living world of Lake Ohrid, comprising 88% of endoparasitic Infusoria (tiny parasitic organisms), 44% of rabdocelite, and 71% of trikladite (flat worms), 90% of snails, 66% of small crabs, and 60% of fish. The so-called intralacustric speciation process, particular for old, deep and large lakes in the world, is on-going in Ohrid lake and it has encompassed even the fish fauna. The size of the Ohrid lake and the quality of its fish fauna underpin its significance in fishing terms. The quality and economic importance of the fish population of the Lake are of a far more higher level than that of the rest of Balkan's lakes, even higher than the shallow and highly productive lakes of the Aegean region. The fish population of Ohrid lake comprises 17 native species belonging to four families: Salmonidae (2 species), Cyprinidae (12 species), Cobitidae ( 2 species) and Anguillidae (1 species). Ten species are commercially important for the fishing industry, priority being given to the two endemic and relic trout species - Ohrid Trout and Belvica, with European Eel and Plasica following the first two. Several analysis have been carried out since 1929. They have shown that the trout and eel account for 45.6% of the catches. That is why the Ohrid lake is also called "Trout Lake". 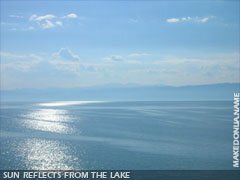 The same analysis has shown that the catchments in the Ohrid lake, in terms of area units, is 9 kg/ha for the Macedonian part of the Lake. This is caused by the low levels of nutrients and is another indicator of its oligotrophic character. Ohrid Trout is well-known worldwide and can weight more than 10 kg. However, in the present conditions in the Lake it reaches the weight of 1 kg in the seventh year of its life. The latter type of trout, Belvica, is smaller than the former. It can reach 30 cm in length and weigh up to one kilogram, but rarely does, since this weight can be reached only in the twelfth year of its life. The fish Plasica is caught during winter period and can reach 5 to 15 cm in length. The famous Ohrid Pearl is produced by using special technology for processing its scales. Alongside these fish species, there are also chub, carp, skobal, grunec, etc. Due to the main focus on Ohrid Trout in fishing, the Hydro biological Institute was founded in the far back past, in the year 1934. Its establishment, along with the installation of its reproducing units, marked the beginning of Ohrid Trout artificial spawning process aimed at stocking Lake Ohrid with Ohrid Trout progeny. Ever since this process has been continuously advanced. Up til now, the Ohrid lake has been stocked by over 520 million pieces of Ohrid Trout offspring cultivated to various ages and sizes - starting from larvae and up to the age of 18 months. Sexually matured fish caught in the Lake are used in the process of "artificial spawning". First roe and milt are pressed out from the fish. Then, they are mixed in the water environment resulting with in situ insemination of the roe. The inseminated roe is then transported into the reproducing units and further nurtured before being stocked into the Ohrid lake. The Ohrid lake is also stocked with the spawn of the European eel, a species whose natural production circle has been discontinued. The fauna in the Ohrid lake also includes freshwater shells, crabs, sponges, etc. There are four types of sponges in the Lake, amongst which is the most famous endemic round Ohrid sponge that lives in 40-50 m depth. 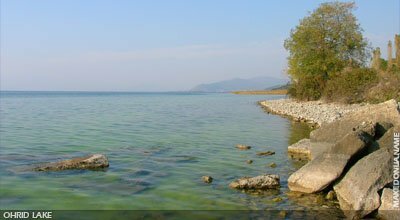 The Ohrid lake's fauna is dominated by various types of algae and superior water plants. Typical for Lake Ohrid is the underwater plant called "hara", that forms a continual ring on the lake's bottom, at the depth of 6 - 15 m.
There are also endemic species in the plankton population (tiny microscopic organisms floating or drifting in the water) - both in zooplankton (animal component) and in phytoplankton (plant component).